Matt standing next to his poster at TAS. Profile Section 9 (PS9) is one of several profile sections along the south wall of the Eagle Cave trench. It differs from the other profile sections in that it is perpendicular to the main trench, and thereby provides a small area of different perspective. PS9, like many profile sections toward the rear of Eagle Cave, suffers from significant bioturbation. PS9 with all strata demarcated as defined on-site. The areas marked with diagonal lines indicate the numerous krotovinas (back filled animal burrows), which complicate an already complex stratigraphy. 28 strata were defined in PS9, many of which were visible in the adjacent PS10. The strata are not numbered in order because some strata were defined originally in PS10 or PS5. In all, there were five strata description events. Areas of interest include a “striated wedge” of alternating light and dark strata in the upper right and the sudden appearance of dark charcoal rich strata in the lower half of PS9. S0261 – Thick, white-gray ashy layer with small laminations. S0260 – Relatively thin fiber layer with some ash, charcoal, and small (<5mm) pebbles. S0259 – White-gray ashy layer with laminations. S0258 – Thin horizontally bedded fiber/ash layer. S0257 – Rather thin white ashy layer with possible small FCR inclusions. S0256 – Light brown fiber layer with some ash and charcoal. S0255 – Sloping white/gray ashy layer with some laminations. S0254 – Rather faint gray white/yellowish layer of bedded fiber and ash. S0253 – Thick white/gray ashy strat with FCR; slightly wedged shape in profile, thickening S->N. S0252 – Horizontally bedded fiber and ash sloping down to the N.
S0251 – Light gray ashy compact strat sloping down slightly S->N. S0060 – Dark, relatively thick organic layer; thickens as it continues N.
S0152 – Light ashy layer that thins as you move N across the profile. S0194 – Brown organic/fiber/charcoal strat with darker layer in the middle. S0195 – Thin layer of darker fiber chunks/charcoal. S0196 – Compact light brown, fine-grained organics. S0154 – Thin yellowish-white ash layer sandwiched; strat thickens S->N. S0197 – Brownish gray fiber layer sloping down to the N.
S0198 – Very flaky dark, organic fibrous layer with burned plant material. S0199 – Thin, compacted fiber/charcoal layer. S0200 – Dark gray with chunks of charcoal. S0200 is the “pitfill” defined by the interface strat S0250. S0250 – Interface strat (pit) sloping down from S->N, intruding into and originating from S0205 and filled by S0200. S0205 – Thin, sloping ashy deposit whose top edge slopes sharply down to the N roughly 10 cm from S profile boundary. S0206 – Thin, compact tan-grey deposit with charcoal flecks and decomposing fiber. S0207 – A relatively thick layer of gray/brown ash with lots of charcoal and fiber. S0208 – Thin ashy strat. S0209 – Light grey-brown strat with gritty-ashy and fiber. S0210 – Ashy strat with less charcoal than the overlaying “ashy” layers. S0286 – Brown charcoal and fiber rich strat with many small rocks. 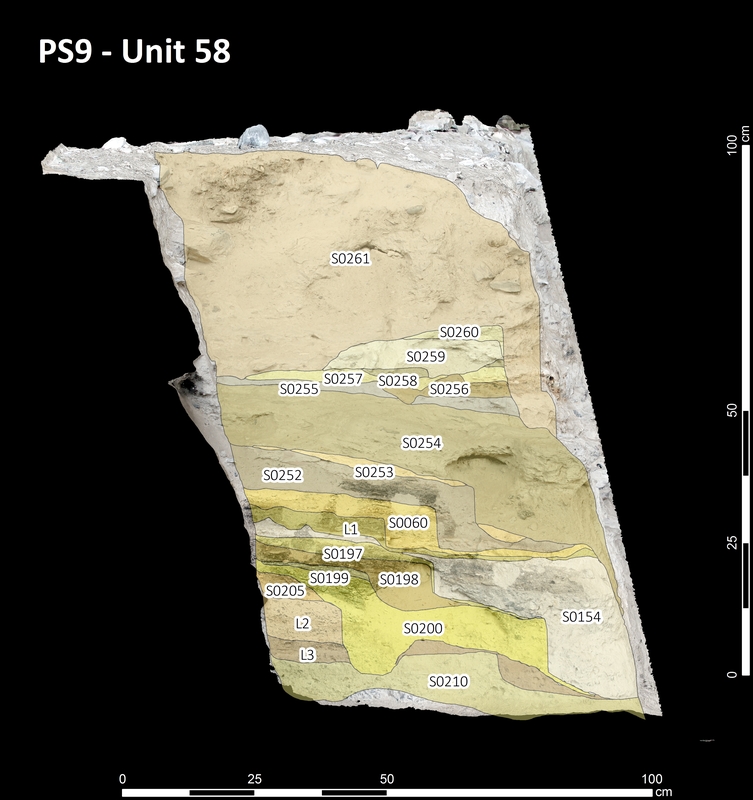 Excavation Unit 58 (U58) was placed to sample all the stratigraphic units (strats) recorded in PS9. U58 was excavated strata by strata, unless individual strats were extremely thin, in which case several related strats would be combined into a layer. All artifacts and sample locations were point-plotted with a Total Data Station (TDS). PS9 with all excavated strata defined. Several sets of strata were too small for individual excavation and excavated as a layer of related strata. 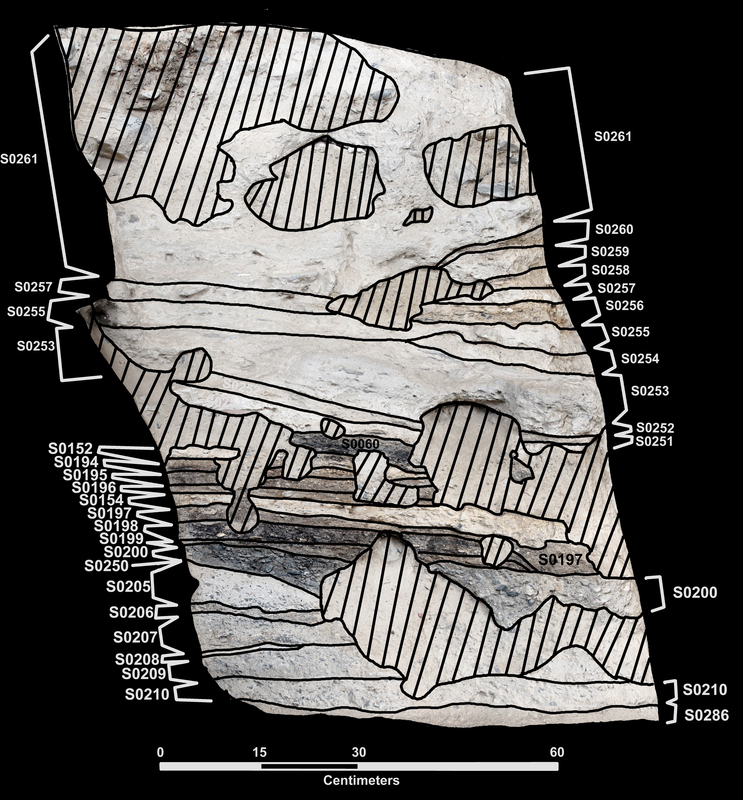 All excavated strata and layers in the image are derived from SfM 3D models and projected on the profile section exactly as they were excavated with a margin of error measured in millimeters. All of the sediment from U58 was collected as matrix samples. Rocks obviously larger than 2.5 cm were put aside, then weighed and counted on-site and in the field lab, then discarded once the data were collected. 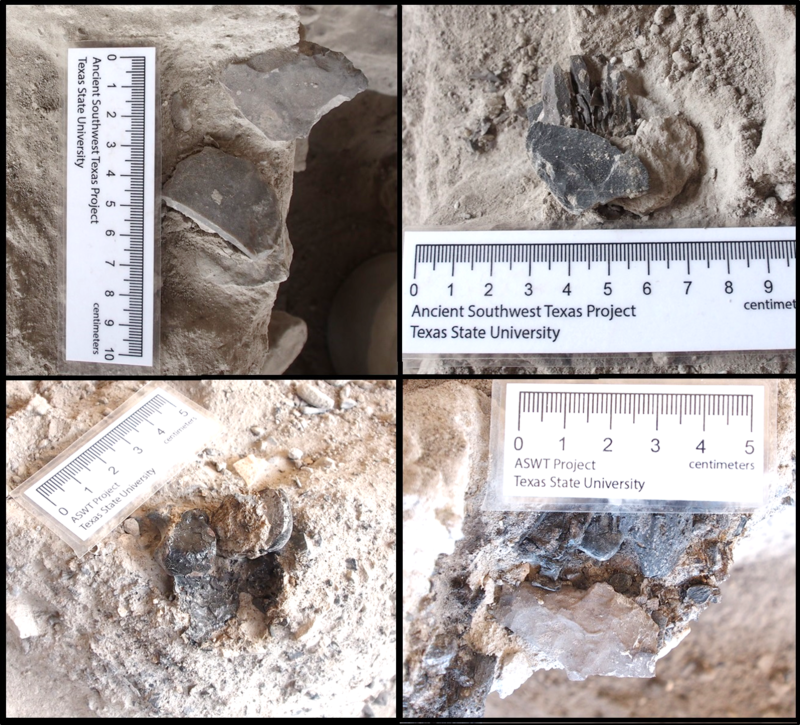 This data will help determine how many earth ovens were constructed in Eagle Cave. In the field lab, each matrix sample was sifted through a ½ inch sieve, and all artifacts and ecofacts were collected and bagged by type. The remaining matrix was split into 1 liter samples, for curation and to send to various specialists for analysis. Artifacts recovered from Unit 58 (lockwise from top-left): edge-modified flake, heat-shattered core, Langtry dart point, charred bone with residue. Modified Flakes. Three modified flakes were collected in PS9. Cores. Four cores were collected in PS9. Three appeared to be heat-shattered, apparently in situ. Faunal Remains. Faunal remains in PS9 consisted of snail, various bone fragments, and two antler tine fragments. One bone tool fragment was also collected. Projectile Points. Three points were collected in PS9: a Frio, a Langtry, and an unidentified fragment. Debitage. 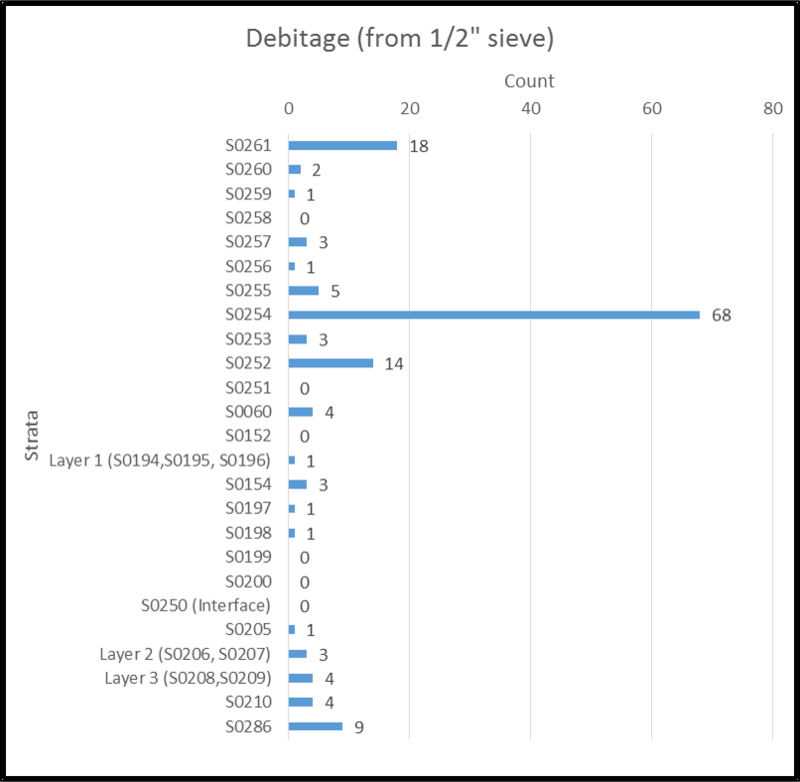 Debitage was collected from ½ inch sieve and was found throughout most of U58, as can be seen in the chart below. Rocksort. 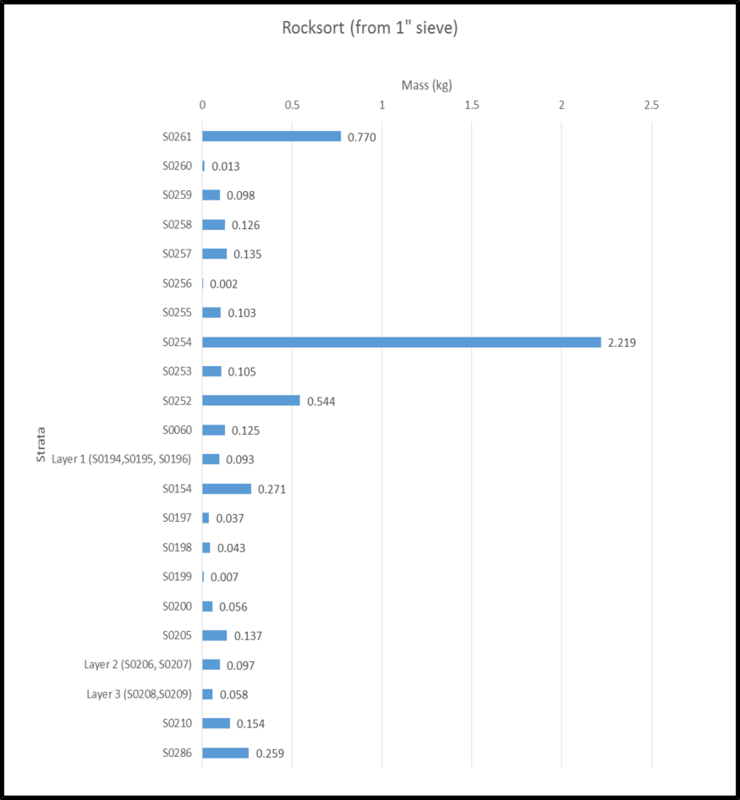 The largest amount of rocks came from strata S0261 and S0254, as can be seen in the chart below; these were also the most voluminous strata excavated. The rocks collected in PS9 tended to be fewer and smaller than in other areas closer towards the dripline. 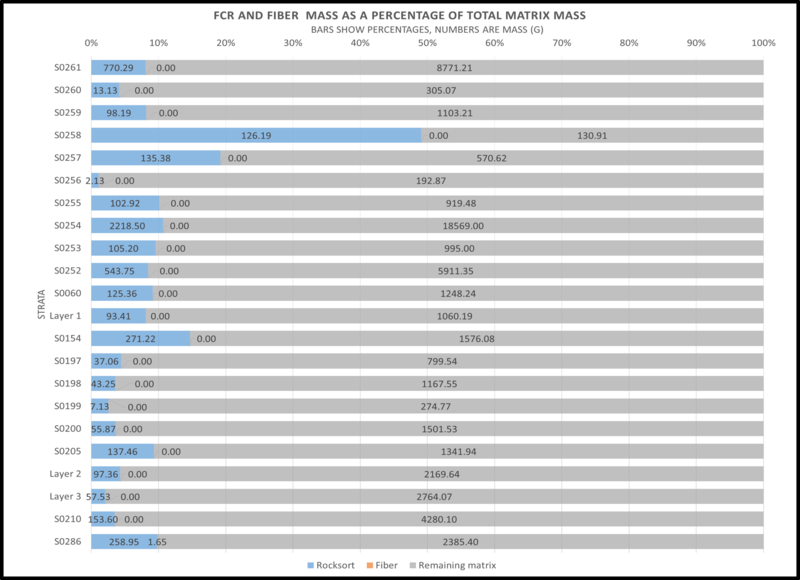 This chart shows the rocksort mass, fiber mass, and the remaining matrix mass as percentages of the mass of the entire strat or layer. This provides a clearer picture of how much burned rock was in a strat as a proportion of the whole. The only fiber was 1.65 g collected from the ½ inch sieve in the stratum S0268 matrix. This is the lowest strat in the profile and may signify the beginning of a fiber and botanical rich zone similar to that seen in PS12. Intern and Archaic chef, Emily McCuistion (top) watches the fire we created to heat the rocks for an experimental earth oven and (bottom) places lechuguilla and sotol hearts on top of the prickly pear packing material in an experimental earth oven. PS9 appears to be located in an area of Eagle Cave used for repeated earth oven events over the centuries. Only a meter to the west are the remains of a hot rock feature (Feature 8) with ash and coal directly under the rocks, as would be expected in an earth oven bed (heating element). PS9 itself has many strata varying between fiber or charcoal rich strats and strats that have a higher volume of ash. In these “ashy” strata are also organic remains burned to white ash as well as several heat-shattered chert cores. Strat S0250 is a distinct stratigraphic interface, which appears to be a pit dug into the material beneath, and filled in with contrasting matrix. The lack of large amounts of FCR, relative to the areas closer to the dripline, seems to indicate the area in which PS9 is located was favored for earth oven pits and cleaned out by tossing spent rocks (and fiber) out towards the dripline. 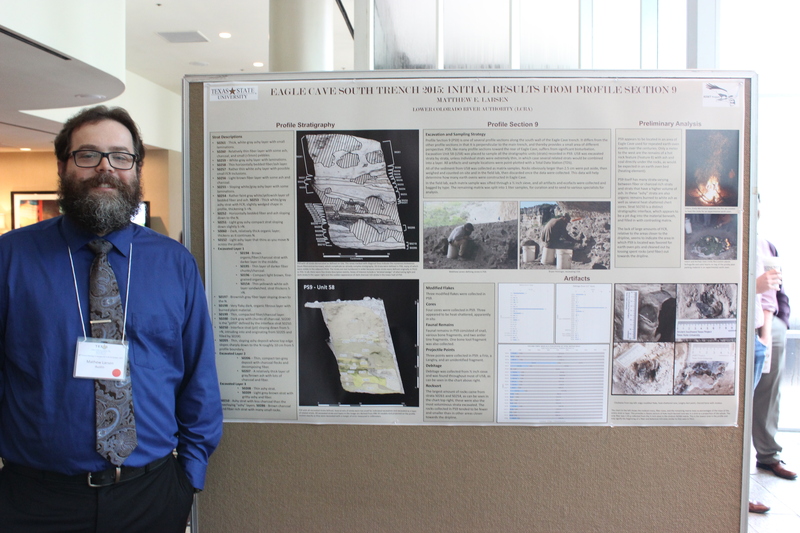 This entry was posted in 2015 TAS Poster Symposium, Eagle Cave. Bookmark the permalink.